Resistance tester can hydrostatic pressure testing samples under certain pressure water-and water performance, sample was fixed in 100cm2 area of the sample holder. 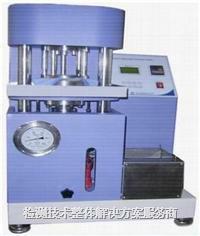 When tested compressed air in the role of distilled water pressure on which produce digital display pressure (water column height). Water pressure (height) increased rate of adjustable (digital controller), and with the numerical cm/points to display and records. Compression speed switch can undertake different low pressure method (10 or 60cmH2O/min) and high pressure method (100kPa/min) test.